Oh, hey, so NYCC happened, and you’ve probably already read Unique Geek’s review, with all of the nice photos and stuff. 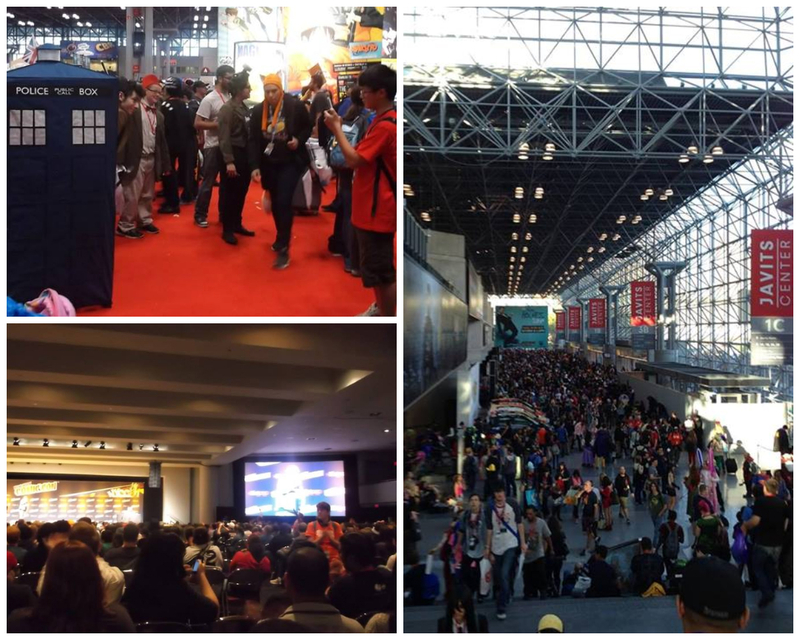 Well, today is my turn, and I’m going to use this post to cover three things – what you can expect at any con, what we learned at New York Comic Con, and what my side of NYCC looked like. This isn’t going to be the least inspiring like Unique Geek’s post; this isn’t going to be uplifting or hopeful or whatever. It’s… it’s a post. Not even a very interesting one. I just ramble about everything that happened at great length. There’s a gallery of photos at the end. Bored? You can read this. You’ll probably be entertained. It’s a post, okay? Okay, good. Moving on. My con experience started on Thursday, as I’d been lucky enough to snag a 4-day pass for a mere $130 (Seriously, can they do something about that inflation?). I arrived early-ish on Thursday, expecting relative peace and quiet, only to encounter a massive horde of people waiting to get in. Why were they waiting? Oh, it’s because of badge scanning and bag searches – which, by the way, were totally halfhearted. Oh, is your massive tote bag filled to the brim and covered with a jacket? I’m not even gonna look at that, go right on in, you couldn’t possibly be smuggling anything dangerous, illegal, alcoholic, or deliciously deep-fried. I mean… It’s not like I -want- them to search my purse, but if you’re going to set up bag searches, make sure they go beyond a halfhearted poke at a makeup bag. Most of Thursday was spent wandering in a daze around the main show floor, where hordes of exhibitors sold me things and threw promotional materials at me. Most of my big purchases were on Thursday – I got a couple Doctor Who Megan Lara tees from TeeTurtle – who had a “buy two get free print” deal going on. Which means that yes, at this very moment, David Tennant is on my breasts AND my wall. I also picked up a Samulet at the Android Sheep booth, (which my friend Ashley and I will forever remember as “That Booth Where We Met Spike And Drusilla Cosplayers At NYCC 2012”). I also picked up some Doctor Who postcards with Nine and Rose on them, and other things. Many other things. I love things. There are photos of me dead on a couch at some point. My friend Leif and I also caught the Haven panel, which was odd, because pretty sure neither of us watch Haven – I know I don’t. It was nice to sit down for a while, though. After the Haven panel, I went roaming through the dealer’s room again, and then ended up finding a really interesting booth for a new game called Mythix. It seems quite fascinating – a card game vaguely reminiscent of Magic the Gathering: Shandalar in its interface and art style; the main difference however is that the game is played in real-time instead of being turn-based. It’s launching first for iOS, but I was told that there would be a PC version also. I really look forward to this coming out! I also encountered a very friendly Carlos and Cecil down in artist alley while seeking my friend Leif, whom I tend to misplace on a regular basis (sorry, bro). Also while at Artist Alley, I finally bumped into my friend Shelley, whom I’d been seeking (and not catching) that whole day. We had like five seconds to talk because I needed to be in the E Hall somehow. Finally, after a mad dash to the other side of Javits center (total time: 5 mins) I made it in time for the comedy kick-off show. Most of the comedians were hilarious, except for whoever the hell the chick who’d gone on 2nd to last had been. Seriously, she was AWFUL. Not sure if she knew why she was there any more than we did. The others were fantastic though, but pretty sure her 20 minutes were actually 20 hours long. Friday pretty much consisted of leading a very confused Unique Geek (usually referred to as Cecelia because she has a name) around the main show floor. She and I are complete opposite in pretty much most things, and NYCC was not an exception. My idea of fun is ducking and weaving through aisles upon aisles of the worst things that Times Square had ever had to offer – and 98% of those worst things are wearing cosplay and posing for photos in the most inconvenient place possible. There are things and stuff and stuff and things everywhere and I just love it so much. Cecelia? Umm… not so much. Sorry. First thing we did was arrive to get into line for the Geek & Sundry panel. I actually arrived 5 minutes before Cecelia, and startled half the line with my ringtone – it’s customized to make the TARDIS whooshy noise every time Cecelia is calling me. This is a thing that kept happening all day. Of course, we were only 45 minutes early, and as such, we were unfortunate enough to be right at the head of the line when they announced there was no more room to get into the panel. There went my shot at being in the same room as Felicia Day. Then, we got lost a bit, realized that the main show floor is a merch tetrahedron, separated for a while then reunited at the Artist Alley, where she had obtained friends, which is positively gargantuan this year. I think it’s two times the size of last year’s? Anyway, it was huge, take my word for it. We lost each other there often. I think we went to the food court around then? I don’t know guys, there must have been a lot of people cosplaying the Silence. I think I bought a lot of postcards and stuff. I have a postcard fetish. I keep them in photo albums and when I want to see things I take them out and LOOK AT THEM. Hey, it could be worse – some people collect body parts. My grandmother collected stamps. The Benedict Cumberbatch AMA happened at 2:30. By the time I could get some semblance of signal on my phone and got Reddit loaded up, Reddit was down. Good job, everyone, we broke Reddit. Finally, our friends Ashley and Erik arrived (whom I have to thank for half the photos in this post, because most of those I took sucked hard and blurred much… thanks you guys. Loki loves you) and found Cecelia and I huddled behind the Adventure Time Chevy at the Chevy booth. As proper Supernatural fans, we made sure to make the Chevy booth our landmark at the con. We probably wandered the merch tetrahedron for a while and then went to obtain food, I don’t actually recall. I do recall I had a burger around the time we were joined by our friend Leif, and that the burger was delicious. DISREGARD REST OF POST. BURGERS AT JAVITS CENTER DELICIOUS. Best part of Friday? The costume contest, 1000%. Cecelia did Khaleesi things to my hair while we lined up. Leif and I played a bit of the Welcome to Night Vale podcast and informed her helpfully after the fact that once you have heard the Voice of Night Vale, you were destined to move to Night Vale and could never leave Night Vale. Oh, and Night Vale is everywhere. Wikia gave everyone a free cosplay magazine with Katniss on the cover (were they telling us to dress up as Hawkweye next time?) Also… KHAAAAAAAAAAAAAN. That is all. Saturday was Winchester Day for us, although no one noticed that we were the Winchesters. Here’s the problem with cosplaying Winchesters to a non-SPN specific event: no one realizes you are the Winchesters. Take Dean by himself – looks like someone’s gotten lost on their way to the Harley Davidson convention. The Motorhead shirt probably doesn’t help matters, but come on, are you telling me Dean wouldn’t own a Motorhead shirt? And then take Sam by himself – hipster with too many layers on and way too many high expectations for future that don’t involve basically being suicidal eight seasons or so from now. I can take great comfort in the fact that someone on Reddit told me afterwards that we really did a great job and that our coats looked very accurate. Also, I was too late to buy tickets to the Felicia Day photo op. This was probably a blessing in disguise. Still, I wish I had a pic with her where I’m visibly Dean. I blame this on the bus crash on 34th and my inherent chaos field. Our Saturday experience otherwise consisted of a really fun Doctor Who photoshoot on the outskirts of Artist Alley, that Unique Geek temporarily transformed into Amy Pond for (and Dean watched from the sidelines because that is what Dean does). Life hack: Lady Sam Winchester can be easily transformed into Amelia Pond with a change of shirt and shoes. Our friends Ashley and Erik arrived as 11th Doctor and Bane; Bane is immune to Dean’s pterodactyl shrieks. It was funny. Then, we went to eat because hunger, and I stood in purgatory line for about a year half hour because I wanted a burger, dammit. I got a burger at last, and Cecelia helpfully informed me that they’d thought I’d died. Thanks for not looking for me, Sammy. Why is there an iPod dock in my car? Why is it playing Death Cab for Cutie? Oh my god it’s like a man can’t die anymore without his brother turning into a free-range hipster! …sorry, went a little Dean there for a while. Once you go Dean, you’re forever Dean. After food was consumed, we wandered the merch tetrahedron a while more, and then split up to go to different panels. My plan was to arrive to the John Barrowman Q&A an hour ahead of time and get in line; this plan backfired. I walked into Hall E, saw a line long enough to stretch through an avenue block. “Who you guys waitin’ for?” “Oh, John Barrowman.” Cue Dean noping the hell out. I joined Cecelia at the line for the Dracula panel instead, and took the time we were in line to put together the World of Warcraft figure that they’d been handing out at the Mega Blox booth when I’d passed by. It’s totally awesome by the way, has a little sword and everything, and I’m 98% sure it’s a blood elf warrior. I only played til like level 18 and got bored though, so I can’t tell for sure. We were also at the panel for the upcoming show Futurescape, as we actually got in line early enough to get into line for the panel before the panel we were going to see. It seems pretty thought-provoking and interestingly made. I might actually watch it at one point… if I ever catch up with Game of Thrones. We actually saw a paralyzed guy using an exoskeleton to walk, which was pretty revolutionary. I found myself thinking, this is history. I’m here, playing Blockd on my phone, dressed up like Dean Winchester and the 80s aren’t over, and here’s history being made right in front and slightly to the side of me. There was a wall on the left. Finally, the time for Dracula screening came, and we dashed to the front and somehow got the best seats in the house. We shook off the vague feeling of being redshirts due to being in the front, and watched the Dracula pilot. Guys. It’s good. It’s like a steampunk vampire Tony Stark got his own TV show. It’s… it’s good. I don’t want to like it, but I like it. Also, may I compliment the actor on his exemplary vampire-rapey-eyes? They’re quite convincing and rapey. No one’s got a gaze as serial-killery as Ian Somerhalder, though. That guy is scary. Anyway, long story short, it was good, and they gave us free copies of the Dracula books with the actor fellow on the cover being all vampirey and rapey-eyed, which is great, because my old copy of Dracula was printed in 1987 and falling apart. Thanks, NBC! Then we made our way to the costume contest again. Found Leif again. Balrog selfies happened. Also notable – the Ultimate Protagonist; the really good Abaddon cosplayer that we really wanted pictures with but couldn’t find afterwards; the Balrog; the Queen Amidala. It was great. Oh, and Ashley got us ID laminates to identify us as Sam and Dean Winchester. Thanks, Ashley! I started the day by buying like twenty bucks worth of dumplings and sushi at Woorijip on 32nd between 5th and Broadway. That place is like, the best. I arrived at the con, bought a pet tribble, found my friend Aaron, consumed some food in a hidden stairwell with him and he suggested I name the tribble Trouble which is exactly what I am doing, and then Unique Geek was lost looking for me. (Sorry.) We then went to Hall E and actually got in as they were doing some panel that I already forgot about and got some seats; I played with my tribble a lot (not an euphemism). I ate MORE food, took a nap, wished for Starbucks. Repeat ad infinitum. Also, it was really cold in there. We got better seats at some point in between panels I didn’t care about. Finally, Sleepy Hollow panel. OMG. I had a brain spasm when they came out because I didn’t think the WHOLE cast was going to be there. OH GOD. THEY ARE SO FLAWLESS AND PERFECT AND SQUEE. Tom Mison said that Ichabod’s relationship with Abbie is “platonic”. I wept tears of joy into my tribble because I do not ship Ichabod/Abbie. I like them as bros. I feel that what we really need is an accurate and believable bromance between two people not of the same gender. BROMANCES ARE THE BEST. Okay, good, glad we got that established. We also saw some exclusive footage from an upcoming episode, and it was funny and then it wasn’t and then oh god my emotions oh god. After the Sleepy Hollow panel, we departed to do… things. And stuff. Mainly last-minute shopping, because it was 3:30 and the con closed at 5. I did my ninja thing and ended up with MORE STUFF. Like, you know, a light-up miniature TARDIS from Whimsic Alley. And umm… more stuff. Things. Stationery. I have issues. Also, I move faster than a text message inside the Javits center. This is, according to Ashley and Cecelia, not a good thing. I disagree. Anyway, I’m the worst to shop with at a con but to be fair, I had something I needed to get in the 300 aisle, and they were in the 2800s. It was an emergency. 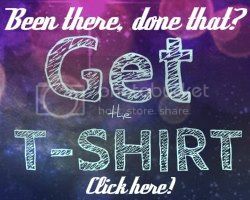 Also, I saw this shirt there, and OH MY GOD if you want to see Thorki twerking you will click on that link right now. Then… the con was over. They herded us out the door and Cecelia and I spent an hour watching toddlers misbehave while in cosplay and pondering how this was an accurate symbol of our entire NYCC experience, until we realized Ashley was regenerating. She helpfully texted us all the photos of the process, except for the part where she exploded into tiny bits and turned from lady Matt Smith into lady Peter Capaldi, probably destroying her phone in the process. Also, someone stole a bunch of photos of people with John Barrowman from the place where you’re supposed to pick yours up. Good job, nameless A-Hall, that was a mean thing to do and you did it. This is why we can’t have nice things. Also, it was really cold. And my tribble is awesome. No regrets. Dammit, Sam, we don’t have time for your wibbly-wobbly, timey-wimey… oh okaaaaaay, nevermind… you guys look great. CYBERMAN BUST. GOOD LIFE CHOICE. Came with a tiny booklet on Cybermen. The best time for selfies is when a Balrog is behind you. Also, the Winchesters do not fly, though they are, quite arguably, fools. I made sure not to touch him,and told him to go to his room. Navigating show floor very hard when many people carrying giant hammers at eye level. My pet tribble, Trouble. They had a lot of them at the Tribble booth. If you tap it on a hard surface, it quivers and squeals. Best life choice ever. UG is a real Ravenclaw with a camera. Fun story – I was trying to find UG at the time, and just as I was taking the photo, my phone rang. It was UG, and when UG calls, my phone makes the TARDIS whooshy sound. Everyone was pleasantly startled. Also, Doctor and wedding!Donna cosplay – definitely one of my favorite Doctor Who cosplays this weekend. 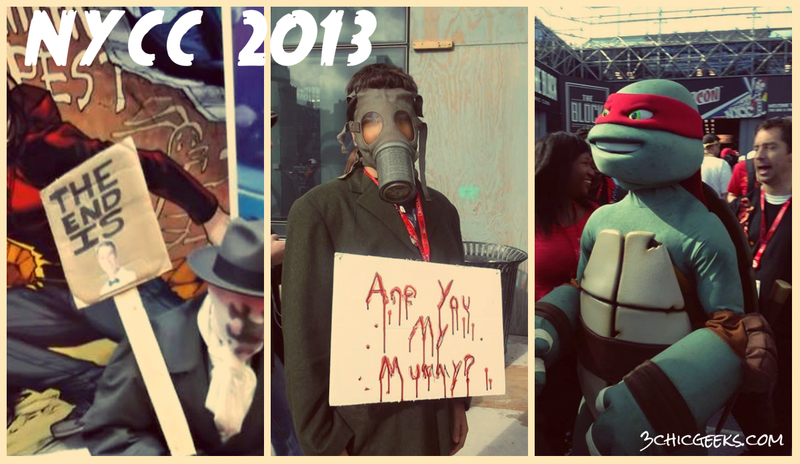 Teenage mutant ninja turtles go to cons too. New additions to my Wall of Loki – an art (thanks Ashley!) and a Destroyer. Fun story, koala-hubby REALLY wanted a Destroyer when they came out but we didn’t get one at the Toys R Us when we had the chance. Took two years to find one. We have it now. Success. Megan Lara print, obtained at the TeeTurtle booth. They had a “buy two shirts, get a print free” thing going on so yeaaaaah I have two Megan Lara shirts and David Tennant on my wall now. No idea what this thing is, nor whence it came, but it sure is cool, right? Limited edition lead hand-painted Loki figure from the UK. He’s now on top of the computer at the studio, sneering at everyone. My miniature 11. He has a tiny sonic screwdriver! Miniature World of Warcraft thing that the Mega Blox booth were giving out. It’s… quite awesome, actually. Has a full range of movement, was moderately challenging to put together (mainly because I was a Winchester at the time, and like a proper Winchester did not read the accompanying instructions) and the painting is very good quality. 10/10 good life choice. I really appreciate the transformer at the Chevy booth. Comedy Show on Thursday, to prove I’ve been there. Fun party game: Identify all fandoms in this picture. Then there was that time I got beheaded by Blade. It was awesome. Ashley found this Cecil at the con and taunted me with him because he is like 87% MY HEADCANON OF CECIL. You know how the saying goes, guys – if you’re a female on Supernatural (or in Supernatural? or in a SUpernatural shirt?) you’re going to die. Light up mini TARDIS that I got at the Whimsic Alley booth. Also a good life choice. BALROG. With a light up whip. UG does Khaleesi things to my hair. I am not pleased. Seen at the 7-11 on 34th on Saturday. Small wizard child comes face to face with startling pink being. How was your NYCC experience, if you went? If you didn’t, what did you want to see? Did you actually read this whole post, because if you did, we’re proud of you. Leave us a comment with your thoughts below, or hit us up on Facebook and Twitter. Categories: Event | Tags: 2013, balrog, cosplay, doctor who, dracula, Event Review, lord of the rings, New York Comic Con, nycc, Sleepy Hollow, supernatural, winchesters | Permalink. I love candlelight dinners, long walks on the beach and killing demons. Usually you can find me at rock concerts. 90% of redditors believe me to be male. I'm pretty sure I'm Loki. I loved this entire weekend. I want more fun times with you and Moose Sam. I CAN BE YOUR ABADDON! “Long live the Queen.” In fact, I will now be your Abaddon in your group, even if she is a demon, evil, and deliciously attractive. Not sure if I want to be her, or be inside her. Hubba hubba. And can bring Dean on his knees. Where he belongs. Should’ve included my regeneration photos, tbh. I would totally do a photoshoot of myself as Eleven, turning into Twelve. Because, Loki. Or prostitute jello. Not sure which.